Spring bumpers serve two purposes. One is to restrain sectional doors from traveling too far. On vertical lift doors spring bumpers prevent the cables from coming off the drums when the door travels too high in the tracks. As the door rises the cables move down the grooves of the drums decreasing the moment arm. After the door reaches its normal height, the cables begin to rise on the inside hubs of the drums. This increases the moment arm which causes the door to stop. When the door is thrown up too hard, the cables over-ride the raised inside grooves of the drums and the cables come off the drums, often causing the door to fall out of the tracks. On high lift doors something needs to stop the door from traveling too far after it reaches its normal height. Often this accomlished with longer track bolts or by installing angle at the ends of the horizontal tracks. If the door comes up too hard on a manually-operated door, the top rollers will hit the bolts so hard that they bend the top fixtures. When these are left unrepaired the top section of the door will often fall out of the tracks. The second purpose of spring bumpers is to prevent cables from coming off the drums when jackshaft openers such as the Liftmaster 8500 are installed. Regular trolley openers pull and push the tops of doors to open and close them. Jackshaft openers, on the other hand, turn the torsion shafts to open and close the door. The door must always be free to roll down the tracks. On some doors the inside ends of the horizontal tracks are pitched down and the door will not roll down when the shaft turns. 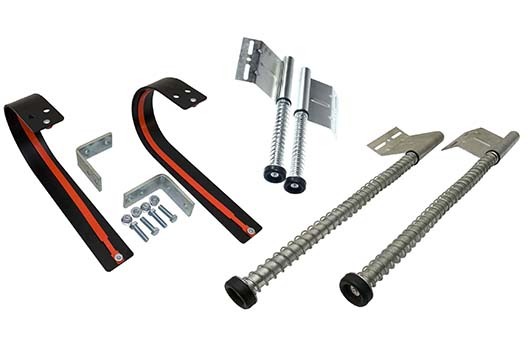 There are also many situations where the doors have worn hardware, bent tracks, and binding hardware whch prevents the door from lowering when the opener turns the shaft to lower the door. These spring bumpers provide initial thrust to start the door down on these doors. More information is on our blog titled How to Install Push Down Spring Bumpers.